← Council Election, Saturday 10th September. On the eve of council elections, a war of words has broken out between Byron mayor Simon Richardson and GM Ken Gainger over the Council’s steam weeding program, which the mayor allegedly said on radio had been ‘set up to fail’ by staff. The comments were apparently made during a round of interviews with mayoral candidates on Bay FM last Friday. ‘I’ve also been somewhat preoccupied this week, and so until I receive this information I will be focusing on other matters and hope to provide the response required as soon as possible,’ he added. ‘Since 2013 Council’s glyphosate use by Open Space crews has been reduced from 16,925 ml to 540 ml (2016). Overall including Works portfolios (roadsides etc) glyphosate use has been reduced by 27 per cent,’ he said. ‘Since March this year chemical treatments on roadside vegetation has ceased. Council now operates its own steam weeding machine and so far this financial year $25,000 has been spent in steam weed control around playgrounds, public amenities, high use public areas (including some sports fields) etc – the annual budget for this work is $100,000. ‘Council has also recently contracted further steam weeding resources (external provider) in the Mullumbimby main street. Council’s Better Byron Crew who look after the Byron Bay Town Centre have been hand weeding for some months. The annual chemical treatment of Bindii weed program has also been suspended this year with treatment being replaced with manual hand removal. ‘These collective actions are supported by Council’s insurers,’ Mr Gainger said. ‘It is great to know that staff are on board with the new way of treating weeds in public, open and highly used spaces and I look forward to further success in this area for the benefit of our community and environment. ‘It was however, unfortunate that the externally drafted Integrated Weed Management Strategy was of such a poor quality that the Biodiversity and Sustainability Committee had no choice but to recommend it not progress but begin anew. Again, staff were in agreement,’ Cr Richardson said. Mr Gainger said that earlier this year staff had proposed a new Integrated Weed Management Strategy aimed at progressively delivering on Council’s chemical free target to the Council. ‘Council voted to have this draft strategy peer reviewed but has yet to vote the $20,000 needed to instigate this action,’ said. ‘The steam weeding machine purchased by Council is the equivalent in terms of effectiveness of any similar machine currently available in the region. It was chosen after extensive field trials,’ Mr Gainger added. There are less then a hand full of bush regeneration chemical free sites on Byron Shire and Byron Shire Chemical Free Landcare is one of them. Although we work on the Dunes the chemical free aproch that we use can be aplyed in any plant comunity. We target climax enviromental weeds, in case of the dunes Bitou Bush and exotics vines. I never receive a email or phonecall from the contractor doing the draft for an Integrated Weed Management Strategy, which cost up to $30 thousands. So if you place a contractor that do not have experience on chemical free weed management offcourse the strategy will not work. If the consultance visited all chemical free sites on the area and discussed with the people working on the grounds how are they doing, them yes there is a chance of some practical strategies to come forward. Them the council staff purchase a steam clean machine for another $38 thousand. I read the “trial report” from staff to the Counselluers regard using a steam weedding machine prior to the purchase. It wasn’t a tril as it had no consistent methodology of reporting or followp. Also a steam cleaning machine is very diferent of a steam weeding machine when come up to the strength of the heating mechanisms. It really hurts as a rate payer to see $68 thousands to be miss spended. At least the cleaning steaming weed machine could be donated to the people that clean play grounds and toilets, however the budget was to improve chemical free weed management and have being wasted. Of course chemical free weed control will not work at the eyes of Council staff because they do not belive in it from a culture perspective and they have being train to depend on herbicides by education institututions. Once the war on weeds aproach move out of the way, them pehaps they will be alble to see a diferent road of sustainable weed management. I am not impress my self with as in the past 6 years we have ask for support and have recive bits and pieces: 6 signs and 25 metres of fence. Yes our site is in Crownland because in 2010 that was the only place was offered after community raise concerns regard aerial spray on North Head and demand a area for a new aproach to be implemented. That was the born of Byron Shire Chemical Free Land Care. The north boundary of the site, a stretch of 25 m by 100 m is Council land maneged by Council and is at the front of the beach side were a recently 25 m of fence was build from left over posts and wire from another dune care site. However the only reason we are there is because I went to a council meet and report to counsuller that the staff have told as that we have enter council land with not permission. A motion was pass and we were allowed to work on that streep of land. As it has no phisical boundary between crowland and council land, we did not know we were removing Bitou Bush on Council Land, so when I was told by Council staff to move, I ask can we work on this area. I was told not, because they want ot spray there. That was when I went to speak with the counsellor. Recently we have being offered another site of Bitou Bush in Ocean Shore (3000 square metres), what we said yes to protect more land from being sprayed. Once we look the site, we notice ithe Bitou Bush is growing all over the back yard of people properties and it would be very controversial to have it sprayed . 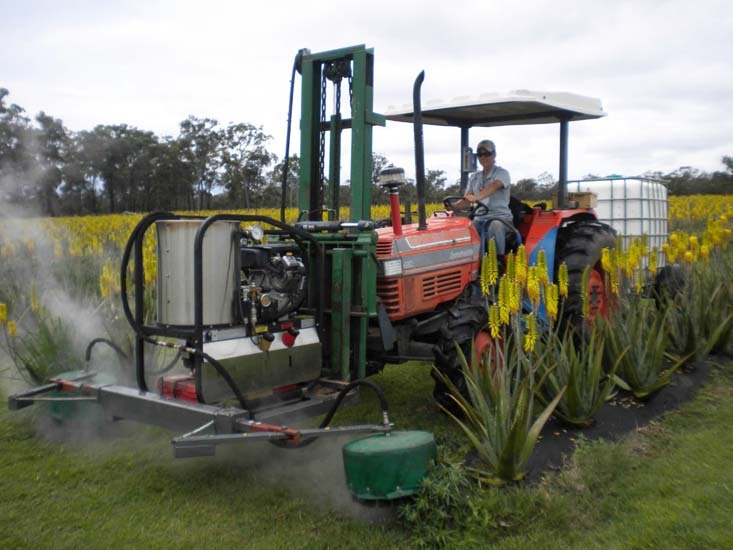 When we ask if we could have some of the recentely alocated $100 thousands grant to spray Bitou Bush from Byron to Tweed, we were told that that funding was only for spraying, not for chemical free contractors. I am trying to feel hopeful, however when we see “the greening” carrying a spray pack full of carcinogenic herbicides I feel that here are a log awy to go. Thank you Dom for all your amazing work.